And Dice will be screwed. So will technical recruiters. That's my guess anyway. I just watched part of a presentation by Joel Spolsky at Google about his startup StackOverflow.com. Stack Overflow is sort of a Yahoo Answers for programming questions. During the presentation, Joel hints that in the future the site could help connect programmers with jobs. Since Stack Overflow members answer specific programming questions, the site knows exactly what technical skills its members possess. This will make it a far more valuable data resource than Dice's resume database. Instead of companies buying access to an unwieldy database, they can probably pay to connect with programmers who actually demonstrate prowess on the site. Through the job board on his blog, he probably has direct relationships with thousands of employers already. Moreover, I have a feeling that Joel probably doesn't like the fact that technical recruiters are so important in recruiting engineering talent and charge such high fees. My guess is he'll try to leverage the data created by Stack Overflow to disintermediate Dice and technical recruiters as well. We'll see how it plays out. Should you apply to business school? The other day, I was thinking about why I decided to go to the business school. Perhaps, I'll touch on that in another post, but I thought it would be interesting to list some of the important questions to consider before applying to business school. 1. What is the exact mechanism by which an MBA will improve your quality of life or career? 2. Do you envision your current job becoming your long-term career? 3. Are there gaping holes in your business knowledge that can be filled by book learning? 4. Can you afford business school right now? 5. What is the exact ROI you are forecasting from getting an MBA? 6. Does applying to school this year fit with your personal life right now? 7. Is this the year you can put together your best application? 8. What non-monetary benefits do you think spending time in business school will provide? 9. What are your alternatives to going to business school? 10. If you didn't get in to your top choice business schools, would you still get an MBA? 11. If you want to take a break from work, what other options can you pursue other than business school? Recently, I encountered two articles that made a combined impression on me. They were both related to internet marketing and the process of customer acquisition, conversion, and product fulfillment. The first was a fascinating article about selling eBooks to monetize traffic on your blog or website. It describes a website called "Parrot Secrets", that provides information about caring for parrots and makes about $400,000 a year selling eBooks about parrots. For all I know the story could be completely made up, but I found it instructive. Now most people that have a blog or website about Parrots probably would think it would be next to impossible to profit from the traffic. Selling an eBook about how to take care of your parrot was an interesting angle I never would have considered. It seems to provide value to the consumer while compensating the site owner. Most interesting to me about the eBook is you are selling a product. Because you are a selling a product with fixed prices and fixed margins (95%! ), you can model traffic acquisition costs and conversion rates to know exactly how much you would pay for a visitor. Once you know exactly how much a visitor is worth to you, you can buy traffic that costs less than that amount. The extent to which this is a large market and traffic is relatively inexpensive, you can grow the business. In otherwords, eBooks scale. The other article I recently encountered was an interview with the ShoeMoney guy. I just found it interesting how he was able to build consumer marketing businesses. He originally built a site around mobile phone wallpaper and ringtones, and then tried about a million different ways to monetize it. Nothing earth shattering, but it was interesting to hear the process of how he built the business. Anyhow, both the articles made me think it would be an amazing learning experience to write an eBook and learn the customer acquisition economics inside and out. It would probably be a cheap education! Are US social networks communist and Chinese ones capitalist? It occurred to me the other day that on Facebook, it doesn't matter how much money you have. The service is free and taking advantage of all of its features is free too. In fact, it's quite difficult to tell who on Facebook is rich and who is poor; we are all equal citizens in the Facebook commune. In the real world, it obviously does matter how much money you have. Moreover, it is easy to tell who is rich and who is poor. People send signals about their affluence from their clothes, cars, housing, and almost all the physical goods they consume. Facebook, on the other hand offers almost no clues into your financial status because there is almost nothing to consume. While US social networks appear to have achieved a near Utopian existence, Chinese social networks are capitalist hotbeds. The Chinese social network Qzone earns nearly a billion dollars a year from the sale of virtual goods. On this social network, it matters how much money you have; the affluent can purchase more scarce virtual goods to decorate their profiles and the poor cannot. If you are poor in real world China, you are poor in social network China. How is that for communism? Our experience on Facebook today may be the garden before the fall. As virtual goods offer perhaps the best way to monetize social networks, I imagine it will be tempting for Facebook to taste the (virtual) apple. If that happens, I think we'll look back on these early days of social networking fondly. Did Google just kill LinkedIn's biggest feature? Interesting new feature from Google - people search! Now you can create your own public profile on Google. When you google your name (or someone else's name) you will see specific profile search results that include your Google profile. When you Google most peoples' names, usually their LinkedIn profile comes up. Going forward, I guess this will be replaced by your Google profile. This is probably a net-negative for LinkedIn and other vertical search engines that specialize in "people search". Will sites like ZoomInfo, Spokeo, Pipl go by the wayside? Pretty neat to see that Google is using Freebase to add structured data to the news. It looks like Google is using the semantic webs service to understand when a particular news story is about a book, movie or TV show. For example, if you search for Philip Roth you can see a timeline of his books from Freebase. You can click through and find related topics and even buy the book from Amazon. I wonder if we are starting to see the emergence of sites that actually "aware" of the type of content they are producing and how it relates to other items on the web. I actually think I saw Eric talk my last semester at the GSB when we did the IMVU case in Andy Rachleff's class on aligning startups and markets. The case (and Steve Blank's book) were really instrumental in shaping my thinking as we designed Personforce. Get a product in the market fast and iterate based on customer feedback was the overall gist of the IMVU case. Eric has a great post about renewable/predictable revenue that demonstrates compelling customer-level economics versus revenue that is a result of inspired salesmanship. It made me think very hard about where our revenue comes from and figure out what camp we're in. The short answer is we started off in the salesmanship camp, now we're a bit of a hybrid, and hopefully we're moving into the predictable revenue camp. Eric's post below definitely struck a chord with me. An interesting note in today's Google earnings announcement was that its business founder, Omid Kordestani is stepping down. Omid was a Stanford GSB alum and he spoke at the school one time when I was there. When Kordestani got to Google, they had no revenue and no business model. He experimented with a lot of different revenue models at Google before they figured out that text link advertisement was a winner. If they hadn't figured that out, it's unlikely Google would be anywhere today. The Google founders had a great technology insight - links can be used as a voting mechanism to rank search results. Kordestani had a breakthrough business insight- when someone is looking for something, it's a heck of a time to serve them an advertisement. Other companies (like Overture) tried similar things, but Kordestani really proved that monetizing search intent was a "homerun". Recent Developments – After ten years of building and managing our global sales and partnership operations, Omid Kordestani has decided to hand over the reins to Nikesh Arora, currently President of International Operations, and take on a new role as Senior Advisor, Office of the CEO and Founders. Continued growth is essential to our future success and no one is better placed to advise on new revenue opportunities than Omid, the business founder of Google. In his new role as President, Global Sales Operations and Business Development, Nikesh Arora will have responsibility for all Google's revenue and customer operations, as well as marketing and partnerships. He has a proven track record at Google, having spent the last four and a half years building our European operations into a substantial business. I spoke to my friend Christian today about a paper he was writing for a class at HBS about how social networks were affecting job search and recruiting sites. 1. Social networks offer reach and targeting. That makes them equally useful to a company's marketing department as recruiting department. In that way, social networking isn't differentially impacting recruiting more so than other functions. 2. Social networks don't attract users that have "search intent for jobs." 3. Search sites (vertical search, Google) are probably more disruptive to the industry in my opinion. 4. LinkedIn is monumentally useful for job search, but isn't really a social network in my opinion. LinkedIn is a big database of contacts so it's useful for finding people. 5. Candidates find jobs through people with which they have strong ties (friends and family), loose ties (friends of friends), or no ties (strangers). Job boards specialize in finding the jobs in the "no ties" department so are less affected by social networking. Social networking can increase the number of people in the "loose ties" group though. 6. New information such recommendations and people's social networking "fingerprints" may become part of the job application. Official Google Blog: Will it lens? : "We've got more details and more pictures of our results on Alan's personal blog. If you have ideas of other things we should try lensing, we'd love to hear suggestions." Rumor has it that Microsoft will be launching a new search engine called Kumo.com. 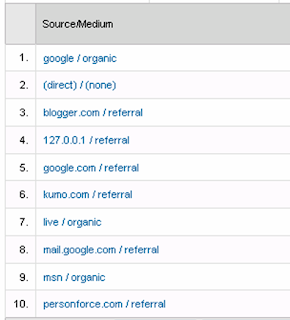 This morning when I was checking the Google Analytics of this blog, I noticed that Kumo.com was referring traffic to the this site. See source #6 in the chart below. Not sure if this means anything (or if it's always been there), but it stood out to me. Does this mean Kumo.com is about to launch? Your guess is probably better than mine. Are paid job postings sites dead? Running Personforce has caused me to think about whether employers will continue to pay money to post jobs in the future. There are a lot of reasons to think they won't. That has significant implications for the recruiting industry and means that sites like CareerBuilder and Monster might not be around in a few years. 1. All job postings are available through Google for free. If a company can post a job to its own site and people can find it through Google, it is less likely to pay money to post a job to a big site. 2. All job postings are available through vertical search engines like SimplyHired or Indeed also. Companies can post jobs to their own websites and they'll show up in vertical search engines as well as a google. Another reason not to pay to post jobs. 3. Any job site can offer an index of all the jobs on the web through Indeed, SimplyHired, or Google's API. On Personforce you can find all the jobs on our network + about 2 million more posted on the web. This means almost any site can offer more job postings than Monster.com or CareerBuilder. 4. Big job sites don't offer the ability to target specific population. Sites like Facebook or TechCrunch give you a much better ability to target exactly the kind of jobseeker you want. Big sites might offer applicant flow, but don't really offer any way to target desirable audiences. 5. Craigslist is free or mostly free. That's not to say that paid job postings are definitely going away. However, I can't really think of any countervailing forces that will prevent these trends from further growing. Well, a couple of weeks ago we started twittering at Personforce. Well, we haven't started twittering exactly. We mostly just publish some job listings on it and a few random tidbits. We haven't really started engaging in "conversations" per say. Without really doing anything on twitter, we seem to be picking up a few followers every day. I'd say these followers fall into two categories: spambots and kind of spammy marketers. The spambot types don't appear to post anything, they just follow people. The marketers mostly twitter about twittering. They tend of have names like Tweet4Traffic and GreatAbs. Some people appear to just post links to ther sites and i'm not sure if they are humans (or dancer). Well, that's the two week twitter report. We haven't quite connected with any real people yet, but let's wait and see! You can follow Personforce here. This week, the company 37 Signals railed against the website Get Satisfaction for misleading users into thinking that Get Satisfaction was handling the the customer support function for 37 Signals. Get Satisfaction helps companies set up their own customer support and feedback function. A company can pay Get Satisfaction to get an nice customer feedback page on GetStatisfaction.com where the company can provide customer support. However, Get Satisfaction set up customer feedback pages for companies that didn't want one (or pay for one). In this case, Get Satisfaction set up a page for 37 Signals (without its permission) that implied that customer support issues about 37 Signals products could be addressed from this page. Users would Google the term "37 Signals customer support" and the Get Satisfaction page for 37 Signals would come up. Users would leave customer support requests thinking this was official channel to reach 37 Signals. Of course it wasn't, so these requests when unanswered by the company. When 37 Signals found out their customers were being misled in this fashion, they were furious. So why would Get Satisfaction set up fake customer support pages for companies that didn't want them? I think this is a classic case of companies doing bad things for the sake of search engine optimization (SEO). The company realized that they tend to show up on the Google Results for "customer support" so they set up a bunch of pages that people might google: Customer support of Comcast", "Customer Support for 37 Signals", etc. I'd hard to believe that Get Satisfaction would have created these fake pages for any other reason than to get increased traffic from Google. It definitely makes me think more carefully about the implications of trying to create content to get more search engine traffic. I guess it's the round 2 notification day for Stanford GSB. A neat thing about the school is the head of admissions calls informs you personally about your acceptance. For those of us that attend the school, the phone call is a long-cherished memory. To all the applicants out there, good luck getting the phone call! And if you don't, may you receive many fat envelopes. CEO at Personforce. We help publishers run job boards.